How do we do a TogetheREAD ? Do we have to do everything in the TogetheREAD? Who made these lists of books and activities? My teenager would never read with me. How can we include him/her? What does my registration fee go toward? When will there be a new theme? How do we make a theme last a full month? Where do we get the books? How do we know which books from the lists are the right ones? What if we don't like the book after we try it for a bit? My child reads above/below grade level. How do I pick out the right books from the list? When can we fit this into our busy schedule? My kids spend half their time with their other parent. How can we do this? Each collection of books and activities is centered loosely around a common topic. The books are different enough to give variety but similar enough that you and your family can read different books on the list (mostly together, or some separately) and still have plenty to talk about and do together. The theme makes it easier to find activities for all ages, too. You can spend as much or as little time as your family wants. Taking the time to find the books and read together at some point is important. Of course you will want to talk about them and maybe try an activity that fits your style. You may find that some months you have more time than others, but launching the new theme can be a regular family get-together. You may find that your family enjoys the TogetheREAD themes enough to make more time for them. 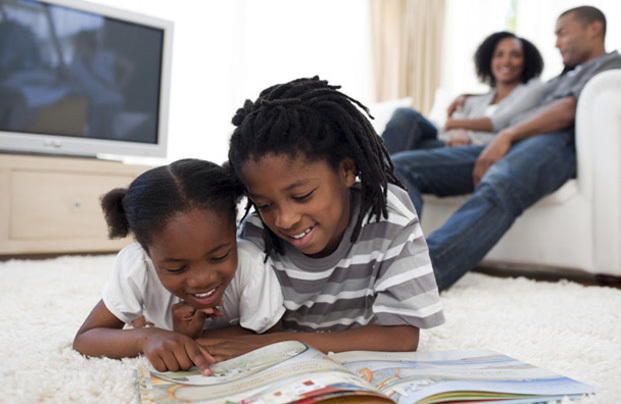 Some families may read the books while waiting for a doctor's appointment or during the 15 minutes before the dryer buzzes. Look for times as short as 15 minutes. Better yet, look for a day when your family could forget TV for just one hour and make a regular "date" for a TogetheREAD. The more you do, the better readers all of you will be and the more fun you will have together. The middle school/young adult and mature teen books are intended so your teenager can read without having to sit snuggled up next to you, if that is not your style. You may want to include an aunt, uncle, "big brother," or grandparent in the TogetheREAD to entice your teen into participating. When all else fails, sometimes the offer of a pizza night to discuss the books sometimes helps. You might also consider including your teen's best friend as a member of your "family" for a TogetheREAD. Your teen does not have to read in the same room with you, but you can still talk about the books in the car on the way to practice or the mall. Even if you and the children's other parent do not talk much, if everyone is reading the same theme, both of you have something to talk to the children about and to do "as a family." There are enough activity options to avoid duplication. Often, children actually like repeating some of the activities. And they will enjoy the "continuity" of sharing the theme in both homes. Of course not. TogetheREAD is offering you many choices of books so you can find the activities and books you like best. If you try one choice and find you do now like it after reading a chapter or two, try another option. There are always several for each age group. Each book listing also includes a description so you know what the book is about. If the books on one level seem too hard or too easy, slide to the next level. The nice thing is that you are still within the theme, so reading level does not matter. Check the descriptions to be sure that better readers are not selecting options that have content that is not age-appropriate. You can always pre-read a book if you are concerned about certain subject matter. Take the list to the public library and ask for help finding the books. If the library does not have the books, they can often borrow them from another library for you, free of charge. Share the list with the school librarian. He/she may be willing to check which books are available in the school and elsewhere, especially if several families in the school or the school parents' organization asks for this help. Check with used bookstores or church book sales. If you do collect several books for a theme, keep them together and offer to trade or loan them with other families you know through school, church, or synagogue. Order the books online and purchase them as a group. Maybe another family will be willing to buy the set next month and share. Tell your librarians where the lists are coming from and show them the TogetheRead web page. They may be willing to try to find the books for you once they know where the lists come from. Tell the library to contact TogetheREAD for some free bookmarks to promote family reading. TogetheREAD will change the theme about once a month. If you read quickly and run out of books try the links at the end of the theme to find more books on the topic. You can also ask your librarian for recommendations. The more you read on the theme, the more you can compare the different books. If you think of other activities to go along with the theme, please tell us! We will share them with other families. TogetheREAD's professional staff developed the TogetheREAD themes and activities. Our staff includes experienced library and reading professionals, as well as practicing teachers. The Reading Strategies that are interwoven in the questions and booklists are based on the research of reading experts. There will always be a free, current theme available on TogetheREAD. Archived themes are available for those who join our site for a small annual fee. TogetheREAD is part of a non-profit learning technologies corporation, The Source For Learning. Our funding supports the TogetheREAD, TeachersFirst, and PreschoolFirst web sites as well as other educational technology initiatives to promote effective use of technology as a tool for teaching and learning. Our activities are designed to bring good resources to as many students as possible, around the world.